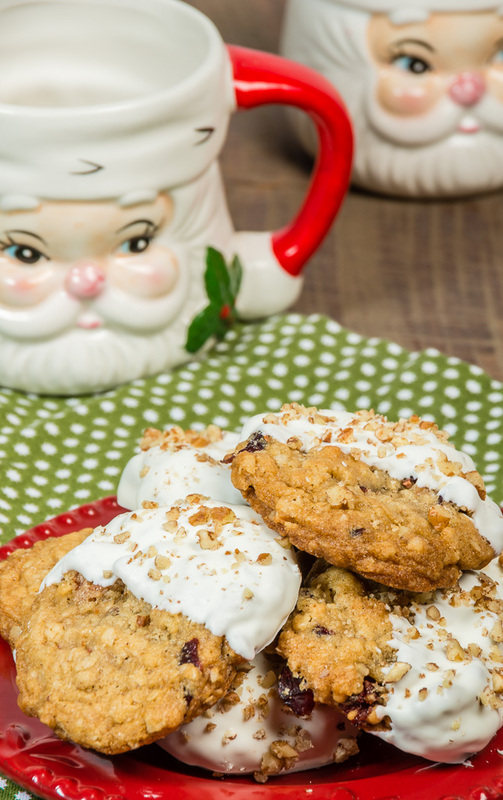 Oatmeal cookies are a must at Christmas time at my house… that’s what my husband tells me. This is his favorite cookie there is always a batch baking in my oven throughout the year. He prefers dried cranberries in his cookie instead of raisins so this year I decided to dress his oatmeal cookies up a little. 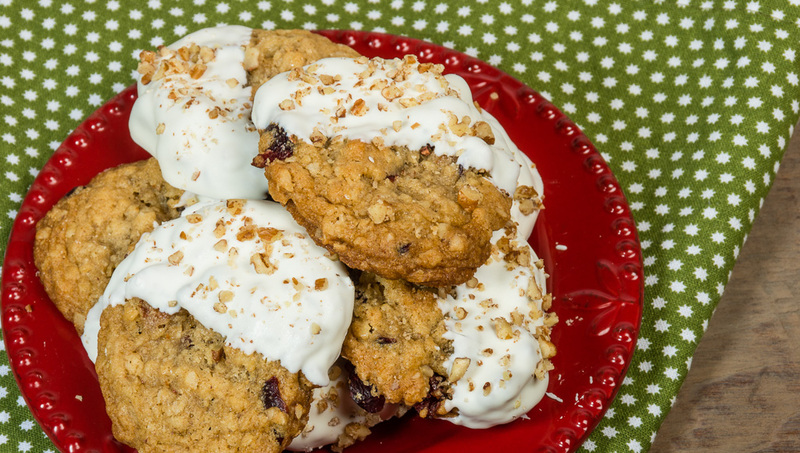 I took the basic oatmeal and cranberry cookie and dressed it up with a dip in some white chocolate and a sprinkle of pecans. Dipping a cookie halfway in white or milk chocolate and adding some accents like nuts or jimmies will make a plain cookie into an extraordinary cookie. Remember to always leave a few plain for the ones who just like them just plain. 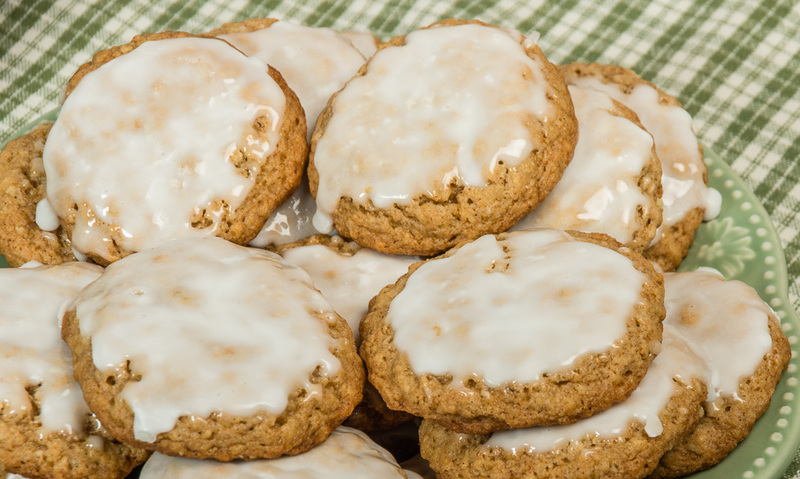 Oatmeal cookies come in all shapes and sizes, chewy or crisp so another recipe I am sharing below is for a crisp oatmeal cookie glazed with a confectioners sugar icing. Both are easy and simple to make for your holiday cookie tin. Preheat oven to 350 degrees. Beat butter and sugars together until well combined. Add egg and vanilla extract and mix until well combined. Add flour, baking soda, baking powder and cinnamon and mix until well combined. Add oats and mix until a thick dough forms. Stir in cranberries and pecan pieces. Place heaping tablespoon-sized balls of cookie dough onto a parchment lined cookie sheet. Bake 8-9 minutes. 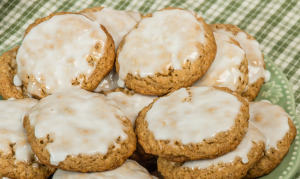 Cookies may look a little undercooked in the center, but they continue to cook and firm as they cool. Do not over bake. If cookies look cooked (not a little undercooked) when you take them out, they are probably overcooked. Let cookies cool for about 2 minutes on the cookie sheet, then remove to cooling rack to finish cooling. Once cookies are cool, melt white chocolate in a small bowl. Dip cookies, one at a time, into white chocolate and shake to remove excess white chocolate. 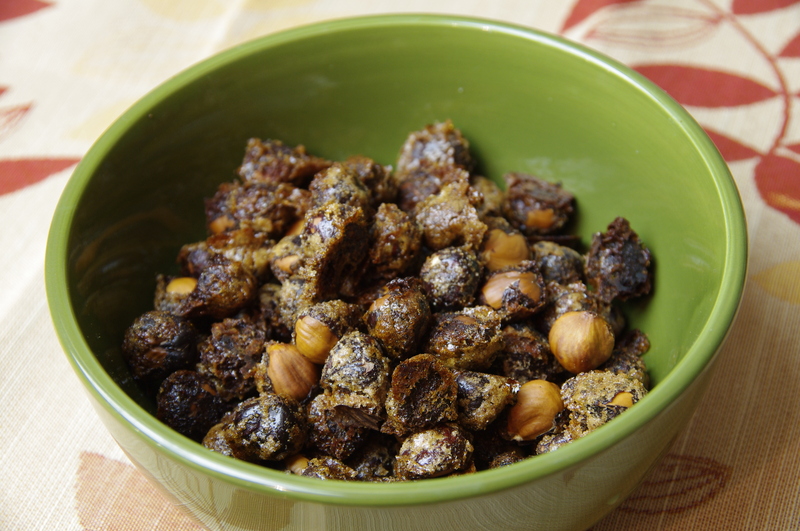 Set on parchment paper and sprinkle with crushed pecans before the white chocolate dries. White chocolate dries fast so I dip three cookies and then sprinkle on the pecans before dipping more. Preheat oven to 350 degrees. Pour oats into a food processor and pulse until partially ground, about 15 seconds. In a mixing bowl, whisk together flour, baking powder, baking soda, salt, cinnamon, nutmeg and ground oats, for 30 seconds. In the bowl of an electric stand mixer, fitted with the paddle attachment, whip butter, granulated sugar and light-brown sugar on medium-high speed until pale and fluffy, about 3 – 4 minutes. Add in eggs one at a time, mixing until combined after each addition. Stir in vanilla. With mixer set on low speed, slowly add in dry ingredients and mix just until combined (scrape bottom and sides of bowl as needed). Allow cookie dough to rest 10 minutes at room temperature. Scoop dough out about 2 Tbsp at a time and drop onto a silpat or parchment paper lined baking sheet. Bake in preheated oven 11 – 15 minutes. 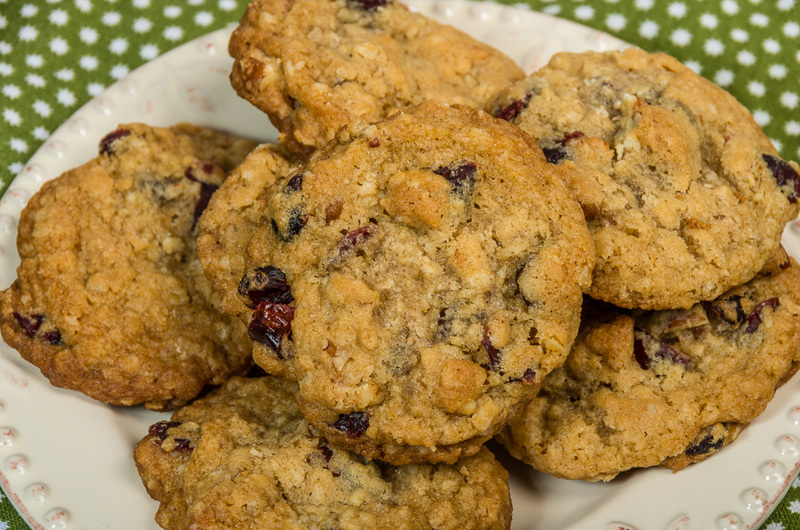 Allow cookies to rest on baking sheet several minutes before transferring to a wire rack to cool completely. In a mixing bowl whisk together powdered sugar and milk and dip tops of cooled cookies in icing and allow excess to run off or alternately spread icing over cookies. Return to wire rack and allow icing to set. Store in an airtight container at room temperature. I must try this!! Has anyone told you that you are AWESOME today? Consider it done! Thanks Kim for the kind words… we so have to meet sometime. We have a unique family connection with are grandmothers being sister and grandfathers being brothers and married we share a closer family tie! Cook the Books! A Cookbook Challenge!